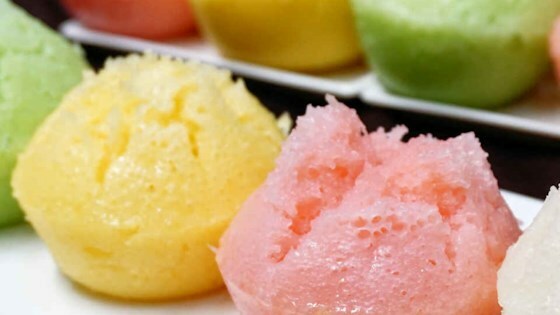 "Easy recipe for steamed rice cake, banh bo hap, a spongy, sweet, and gorgeous-looking vegan dessert. It costs next to nothing to make and fun for the kids." Whisk rice flour, water, coconut milk, sugar, tapioca starch, yeast, vanilla extract, and salt together in a bowl until smooth. Cover with a lid. Let batter rest until air bubbles rise to the surface, about 2 hours. Stir well. Grease cake molds with oil. Place a steamer insert into a saucepan and fill with water to just below the bottom of the steamer. Place cake molds on top and pour batter into each, leaving 1 3/4 inches of space at the top for rising. Bring water to a boil. Cover and steam until a toothpick inserted into a cake comes out clean, about 10 minutes. If it is winter, place the batter in the oven or any warm place. In the summer, keep at room temperature. If using food coloring, divide batter into 3 bowls and drop your favorite colors into each. Use small heat-proof bowls if you don't have cake molds.